At Seven Seas, our objective is to offer value added services to our customers, including handling and delivery of owner's goods. 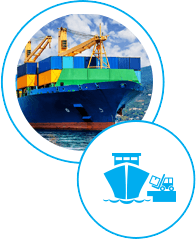 Why Seven Seas Marine Spares Logistics? We offer a 24/ 7/ 365 of outstanding customer service to all of our ports, the offshore industry and ships of every kind. To download our Marine Spares Logistics brochure, please click here.